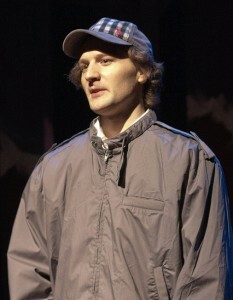 David Fetzer created the role of Everett Reuss in Debora Threedy’s play THE END OF THE HORIZON in 2008 (for which he won a special Arty Award from Salt Lake City Weekly) and a string of roles in her play THE THIRD CROSSING in 2012. David passed away in December of 2012. His family has established the David Ross Fetzer Foundation for Emerging Artists, aka The Davey Foundation, to ensure that David’s love of music, film and theatre lives on. Side note: by day, Debora Threedy is a law professor at the University of Utah, where she taught David’s mother Betsy who would, on occasion, bring little Davey to class with her. 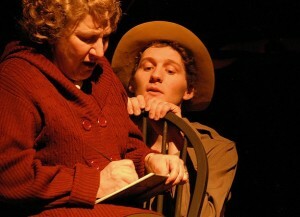 David wasn’t the first actor cast as Everett in my play THE END OF THE HORIZON, based on the mysterious disappearance of Everett Ruess in southern Utah in 1934. Kay Shean, the director, had initially cast another actor, who then had to bow out several months before rehearsals started. Jerry Rapier came to me and said he’d found out that David Fetzer was back in town and what did I think about him as Everett? Needless to say, I thought it was a good idea. Looking back now, I can’t imagine anyone else playing the part. David embodied perfectly the essence of Everett’s fierce determination to live the life he wanted, regardless of what anyone else thought. Moreover, David – who was himself talented in so many creative fields – also brought to life Everett’s artistic side. Literally. As a closing night gift, he gave each of us a woodcut based on Dorothea Lange’s iconic photographs of Everett – a woodcut for which David had carved the stamp himself – during rehearsals! David’s performance in THE THIRD CROSSING, my play about interracial relationships, was more challenging for him than Everett had been. David could draw on his own personality and life experiences to create Everett, but in THE THIRD CROSSING,, he had to play a variety of characters, some of which were not very nice people. It forced David, one of the sweetest, most open people I’ve ever met, to dig down into the “dark side” in order to play a serial killer and a bigoted judge, and he came up with two very cold and very creepy portrayals. I think I admired those most of all the characters he portrayed in the play, because he was bringing to life personalities that were diametrically opposed to his own. Plan-B Theatre Company, in partnership with the David Ross Fetzer Foundation for Emerging Artists aka The Davey Foundation, seeks new plays from playwrights 35 years old and younger who reside in Utah, are Utah natives, or who otherwise have a substantial Utah connection. Click here for guidelines – submissions are now being accepted with a deadline January 31, 2014. The winning submission will be produced as part of Plan-B’s 2014/15 season.